OneNote 2016 has a conversion tool so you can upgrade a legacy notebook to the current format. OneNote 2010, 2013, and 2016 use the same file format so you don’t need to convert files between these versions. You can use them interchangeably. Tip: If you’re not sure which version of OneNote you’re using, look at the title bar of your notebook. If the words [Compatibility Mode] are in the title, you’re working in an older notebook format. Next to the notebook you want to convert, choose Settings, and then choose Properties. In the Notebook Properties dialog box, look at the Default Format to see what format the current notebook is saved in. To upgrade a OneNote 2007 notebook to the newer 2010-2016 format, click Convert to 2010-2016. Note: The 2010-2016 file format can’t be used by OneNote 2007. If you already upgraded a notebook to the 2010-2016 file format you won't be able to migrate it back again. Notebooks on OneDrive use the latest OneNote file format. Users without OneNote 2010 or later can use the free web version or download a free version of OneNote from OneNote to access the notebook. For more information, see File format changes in OneNote 2016. Converting a file is useful if you need to share a OneNote 2013 notebook with people who still use OneNote 2007, or when you've finished sharing a OneNote 2007 notebook and you want to use all the OneNote 2013 features again. OneNote 2013 has a conversion tool so you can upgrade a legacy notebook format to the current format. OneNote 2010 and 2013 use the same file format so you don’t need to convert files between these versions. You can use them interchangeably. Click Settings next to the notebook you want to convert, and then click Properties. To convert a OneNote 2007 notebook to the newer 2010-2013 format, click Convert to 2010-2013. To convert a OneNote 2013 notebook to the older 2007 format, click Convert to 2007. Note: The 2010-2013 file format can’t be used by OneNote 2007. If you already upgraded a notebook to the 2010-2013 file format and you need to revert to the older 2007 format, simply follow the previous steps to convert the notebook back again. Consider making a separate backup copy of your 2013 notebook before converting it to the older 2007 format. 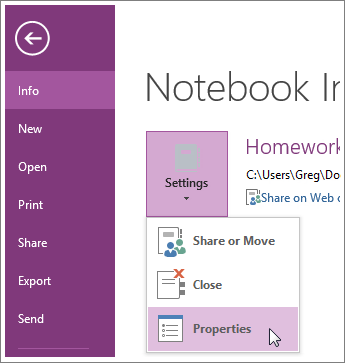 For more information, see file format changes in OneNote 2013.